Daniel: As my blog readers know, instead of boring interviews with all the standard questions, I like conversational interviews. You up for that, L.G.? L.G. : Absolutely! Bring it on—and pass me the Hot Chocolate please. Daniel: Right on. Big hot chocolate fan here. First question: L.G.? Yeah, that’s not really a question. I’m just wondering about your initials? Any particular reason you chose to use letters? L.G. : Yes, I didn’t want to pigeon-hole myself into one genre, or one kind of audience, and I felt using initials left my readership more open. But, just call me Laura. Daniel: Laura it is. 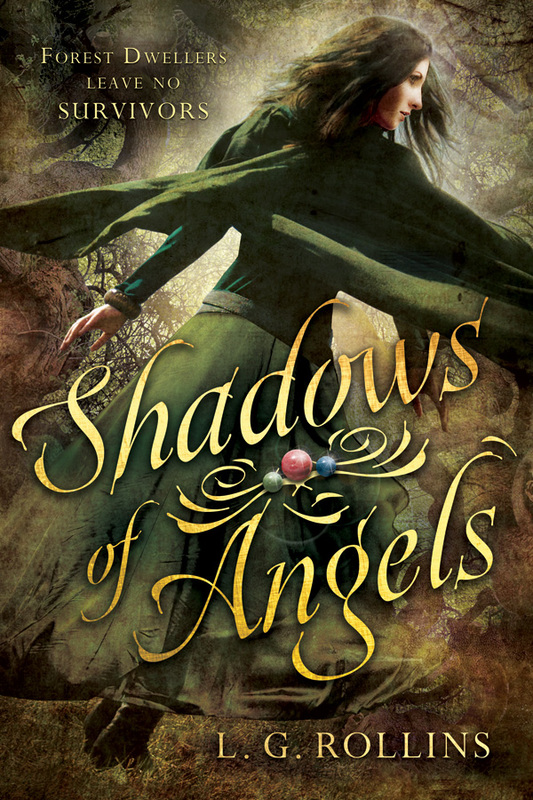 Your first book is Shadows of Angels. It just came out, right? Great cover, great title, great tagline. Tell us about it. In 10 words or less. Or more, I’m actually pretty easy going. Uhh . . . (that doesn’t count as one of my words.) Aerbrin gets a magical stone (one, two, three, four . . . I’ll have to shorten the rest . . .) She’s being hunted but can’t unlock the magic. Finds out the truth no one dares whisper. Cousin gets involved. Meets a transformed Prince. Must find a long-lost King . . . find and rescue that is. Then there is Snugglib, the demon . . . So much for ten words. Sorry. I’ll allow it, but only because I love the name Snugglib. Aerbrin’s father has been murdered for his secrets. Secrets he never told her. Now she has the magical Zaad Stone, and her father’s enemies know it. Instead of running for her life, she delves deeper into the forgotten past of her kingdom and the hidden truths of its present. However, she can’t unlock the magic in her Stone, and it’s the only thing that can save her. Very Eragon meets Witch Song. Nice. I have an excerpt from Shadows of Angels. I’ll tack in onto the end of this conversation. If people gotta have more, where can they find Shadows of Angels? Okay, I hope you’re warmed up because the questions get tougher now. Yes, thank you for the hot chocolate. Do you have marshmallows? Sorry, I’m a hot chocolate purist. Strictly BYOM around here. I shoulda warned you, butI do not subscribe to the Hoops and Yoyo theory of hot chocolate. On with the Interversation! I write character-driven stories because I love living in other people’s heads. Tell us something that makes one of your characters special. Timbrick is a giant talking lion—though he wasn’t always. That was 10 words or less AND AWESOME. Bonus points. Some of my favorite books of all time have extraordinarily long titles: Through the Looking Glass and What Alice Found There. The Strange Case of Dr. Jekyl and Mr. Hyde. Both of those are pushing double digit length. If you HAD to give this book a long, descriptive title with a minimum of ten words, what would it be? What is it with you and ten words? Darn. Usually it takes longer for people to pick up on my number compulsions. Very astute, but just for that, I’m giving you a 20-word minimum! The Perilous Adventures of a Determined Aerbrin, Thieving Vita, Reckless Hilfawn, Little-Old-Lady Teepin, and a Talking Lion with Cabin-Fever. It’s probably a good thing Shadows of Angels was limited to a short title. I love the long title! I’ve got a couple books I’m thinking of re-titling. I’ll PM you for more advice. I’ll give you last words. What do you want to say to my millions of blog readers. And by “blog readers” I mean “Google spiders”. I want to say: Be your own kind of Strong. Aerbrin and Hilfawn are both very strong women, but they’re drastically different individuals. I did that on purpose. ‘Strong’ doesn’t always mean aggressive, bold, or daring. Sometimes ‘Strong’ is persistent, simple, even quiet. Being Strong means being the best “YOU” you can. kids live in Utah so that is where she spends most of her time. She may, or may not, have a Zaad Stone. Stay calm, her father’s words echoed in her head. When you find yourself in danger, stay calm. Aerbrin took a deep, steady breath and leaned down, reaching for her bow. One of the Forest Dwellers charged. It collided with her and knocked her to the floor. Raising a knotted fist, he bashed her head.